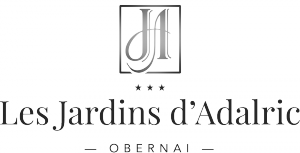 It is in the heart of the Alsace wine route, in Obernai that our hotel Les Jardins d'Adalric opens its doors to you. Located a few cables from Strasbourg, our charming hotel is the ideal destination for an exceptional stay in Alsace. Come and discover the calm and quiet setting of our hotel to spend an unforgettable holiday with your family, a city break with friends or to organise a business seminar. Les Jardins d'Adalric is a hotel located near Strasbourg and Colmar offering its residents the opportunity to discover the cultural and historical heritage of the region. Our charming hotel is the ideal starting point for any tourist stay in Alsace. Take advantage of our privileged geographical situation to taste our local gastronomy. Obernai is full of local establishments and markets. To know the best Tables, do not hesitate to ask us. We will be delighted to show you our best addresses. Near our charming hotel in Obernai, you will find an aquatic complex with sauna, hammam and jacuzzis. Located not far from the town center of Obernai and close to pretty villages typical of the region, the Gardens of Adalric will seduce you with its charming, quiet and quiet. Whether you are fond of gastronomy, green landscapes or typical architecture, the hotel Les Jardins d'Adalric invites you to a stay rich in discoveries. In the heart of a garden planted with trees, the hotel Les Jardins d'Adalric offers 44 contemporary and functional rooms, recently renovated. Divided into four categories, Classic, Comfort, Superior and Duplex Suite, the rooms have all the necessary comfort for a most relaxing stay. Whether you travel alone, in pairs or in groups, you will always find the right room for your needs in our hotel near Strasbourg. In a permanent optics of satisfaction and well-being, the hotel Les Jardins d'Adalric proposes to all its customers a service to measure so that your stay is most pleasant. Before your arrival or during your stay, the concierge will answer all your requests with professionalism and conviviality, in order to make your visit to the Adalric Gardens unique. In the morning, enjoy this hospitality over a hearty breakfast with fresh local produce. After a day of discovery of the riches of Alsace, enjoy a moment of relaxation by the magnificent outdoor swimming pool, sipping a tasty fruit juice. For oenophiles, stay a few moments at the hotel bar, where the wine list is an invitation to a tasting. The most famous of Alsace such as Rieseling or Muscat will delight your palate and stimulate your taste buds.